Since the release of Ivy Bridge-E last year, many users have been complaining about the antiquity of the X79 chipset compared to the mainstream line. X99 comes up to par with Z97 in terms of PCIe storage implemented into the RST along with a full array of SATA 6 Gbps ports and USB 3.0. In fact, the additional PCIe 3.0 lanes of the extreme CPUs (40 on all but the i7-5820K) make more sense for PCIe storage on X99, especially when it is most likely prosumers taking advantage of the newer standards. The movement from DDR3 to DDR4 makes more sense in the data-center space, where saving every watt of power helps bring down costs. DDR4 uses 1.2 volts as standard compared to 1.5 volts for DDR3, and spread over thousands of modules can be a difference in the power bill. For regular users, it does mean that every purchase of a Haswell-E CPU will require a new kit of memory. For the last several years we have been able to reuse DDR3, but now everyone has to factor in the cost of DDR4. This makes the DRAM module manufacturers happy, and as a result in order to get your sale they are offering DDR4-2133 to DDR4-3200 in various shapes and sizes. 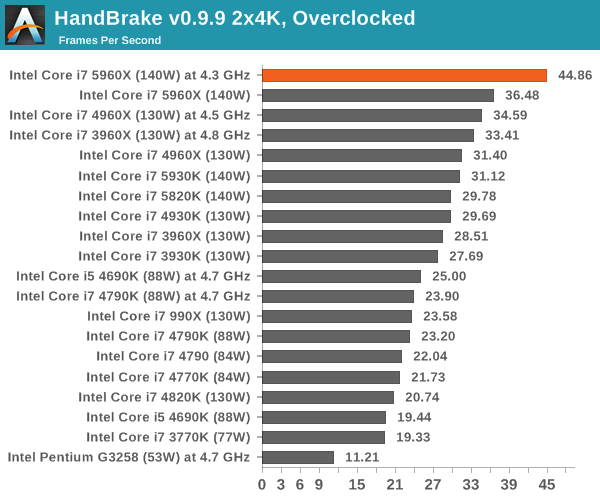 Clock for clock, Haswell-E affords an 8% average boost over Ivy Bridge-E. This we already knew from the jump to Haswell to Ivy Bridge, however the cache sizes on Haswell-E get a boost due to more cores. This would seem to make little difference, but it means that a Haswell-E six-core processor performs similarly to an Ivy Bridge-E processor with a +300-500 MHz advantage depending on the benchmark. Despite the low clock speed of the 5960X, it comes top in multithreaded benchmarks. With two more cores, and thus four more threads, despite the frequency difference to the i7-4960X, any benchmark that can use >12 threads sees a distinct improvement. This includes WinRAR, which has a variable thread workload. The i7-5820K is on par with the i7-3960X at just over a third of the release cost. These two processors have the same core count and same frequency, but differ in their architecture, PCIe lane count and price. With the i7-5820K being two generations newer, it should afford a 10-15% performance improvement in CPU limited benchmarks. This is quite amazing if we consider the release price of the i7-3960X was $990 and the release price of the i7-5820K is $389. The added benefit of the i7-5820K is also the X99 chipset, although one downside is the number of PCIe lanes from the CPU. What this all means is that for $600 less, that two-to-three year upgrade will offer a 10-15% boost in CPU limited workloads, or moving up to the i7-5930K will increase throughput even more. The 28 lanes of the i7-5820K has almost no effect on SLI gaming at 1080p. One question that will come from all sides is if the 28 lanes effects gaming. The CPU will cause an x16/x8 SLI configuration in two-way and x8/x8/x8 in three-way SLI, rather than the x16/x16 or x16/x16/x8. We tested at 1080p maximum settings with two GTX 770 Lightning GPUs, and found that the only benchmark that any significant difference was the average frame rates in Battlefield 4, which dropped from 110 FPS with the 5930K to 105 FPS with the 5820K. It makes sense that we should test this with 4K in the future. In terms of raw frequency, on average, Haswell-E overclocks lower than Ivy Bridge-E. Both our overclock testing and ASUS’ recommendations showed that 4.3 GHz to 4.4 GHz will be a happy medium for most Haswell-E CPUs, however the chances of getting a good clocking CPU might be harder on Haswell-E. In our tests of an i7-3960X at 4.8 GHz, i7-4960X at 4.5 GHz and an i7-5960X at 4.3 GHz, all three CPUs performed similarly unless a benchmark takes control of the newer instructions, or needs the eight cores of the i7-5960X. However users expecting a day-to-day difference in performance while overclocked should not get their hopes up. But even with the 5960X, there are two extra cores. This will be the bottom line: prosumers who invest in the high end platform are more often than not CPU-limited rather than content-creation limited. Encoding a 4K60 video to x265 has a 16% boost moving from the i7-4960X to the i7-5960X, which extends to 30% when both are overclocked. How much faster is Haswell-E over Ivy Bridge-E? Clock for clock, 8% on average. How well do these CPUs overclock? Not as well as Ivy Bridge-E or Sandy Bridge-E, but performance is comparable. I have an i7-3960X at 4.8 GHz / i7-4960X at 4.5 GHz, should I upgrade? Only if you need more cores. I already have the i7-4960X and run at stock, should I upgrade? Only if you need more cores. Do the 28 PCIe 3.0 lanes on the i7-5820K affect gaming? Not at 1080p in SLI. The most promising member of the three CPUs launched today is the i7-5820K, as now the lowest end CPU for the extreme Intel platform has more cores than the highest member of the mainstream platform, the i7-4790K. We can pick up a low-cost X99 motherboard for the same price as a mid-range Z97 motherboard, but the main barrier to adoption might be the high price of DDR4 which stands at around $250 for a 16GB quad channel kit. The i7-5960X comes across as the new champion in terms of non-Xeon throughput, although kudos will lay more on having the up-to-date chipset that users have been requesting. Most people moving from a Sandy Bridge-E or Ivy Bridge-E will not see a day-to-day adjustment in the speed of their workflow on the new platform, and the real benefit will be for those that are CPU limited. Haswell-E does mark the time that Nehalem and Westmere users, or 3820K/4820K users, who do anything other than gaming, might consider switching. Because of the trifecta of new releases today, we put together some systems for users thinking of upgrading. Each one caters to a different crowd, and after the release we will update the pricing as appropriate. This first system is meant to be representative of a user moving from either a Sandy Bridge or Ivy Bridge mainstream system to the extreme side. This mimics my position back with Nehalem, moving from an AMD X2 system all the way up to the i7-920 at the time. For users wanting to have a introduction to the six-core i7-5820K, this build under $2000 uses a lower cost motherboard and a suitable power supply for dual GPU gaming. We picked the R9 285 which is soon to be released, but AMD announced pricing a few days ago at their AMD30Live event. Given my success with the Nepton 140XL in this review in overclocking, the system should offer some headroom, especially when using the MSI OC Genie button. There will be some prosumers interested in just the 8-core CPU, so everything else needs to be lightweight. We've stripped down most of the components here, using a simple 128GB SSD as well as a cheaper liquid cooler. The R7 240 is there more as a graphics output, but one of the major barriers to a super cheap build is DDR4 pricing. At $250 for a basic DDR4-2133 MHz kit it turns out that in order to use quad channel memory the build almost approaches the price of our introduction to Haswell-E build. Amusingly enough we didn't intend this build to be almost $3000, but it sets a good starting point for an i7-5930K build. Moving up to the i7-5960X would be another $417, making it perhaps prohibitive. The X99 WS sits in the middle of X99 pricing, but the workstation designation should indicate a higher level of compatibility with add-in cards. DDR4 is still pretty expensive here, even when selecting a 32GB kit. We used 2x R9 290s although for that price perhaps 3x R9 285s might be an interesting diversion. For a mid-range build the user has the option of a single Samsung 850 Pro 512GB or we can put two 256GB models in RAID. In an almost no-holds barred system, using the 8-core monster and 64GB of DDR4 does some financial damage. Add in a high end ASUS X99-Deluxe, a 1500W power supply, the case and CPU cooler uses another $1400, which is surpassed by a four-way RAID SSD setup. One option here would be to look at M.2 SSDs, however there are few on the market at high capacity right now, so a user might go cheaper with the MX100 and then purchase an M.2 next year - take a look at our SSD roundup for more information. With a high end CPU and power supply, it makes sense to go all out on GPUs with three 780 TIs in the mix. Don't forget to add the price of a 4K monitor (or three) in order for the system to stretch its legs, and make sure to take advantage of ASUS' 5-Way Optimization overclocking.